Sorry -- no dog pictures this weekend. This week continued the spate of strongly improving data - except for housing. Both the Empire State and Philly Fed regional reports surprised strongly to the upside. Industrial production and capacity utilization turned back up, although less strongly. 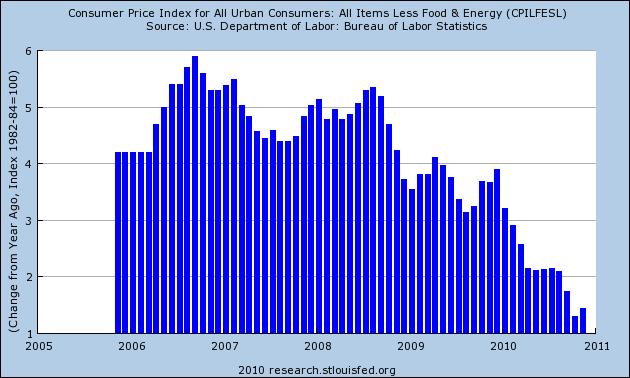 Consumer inflation was somnolent, producer prices not so. Housing permits and starts remained down in the ditch. Leading Indicators came in at +1.1%, meaning the last 3 months are up a combined 2.0%, meaning more improvement ahead. But the star of the show had to be retail sales, which at +.8% continue a 5 month winnng streak, totaling +4.8% - or an annual growth rate in excess of 10%. Most of this week's high frequency data was strong as well. The BLS reported 420,000 new jobless claims. The 4 week moving average fell to 423,000, another new low since early August 2008. Seven of the last eight weeks have shown 440,000 or fewer new claims. As I said last week, if this trend continues (no guarantee), the average will drop below 400,000 by February. Gas at the pump increased ten cents to $2.98 a gallon last week. This is about $0.30 above its average from a few months ago. Oil continued to flirt with the $90 a barrel mark. Despite this, gasoline usage was significantly higher than last year, 9.349 B gallons vs. 8.963 B a year ago. Gasoline stocks remain back in their normal range for this time of year. The Mortgage Bankers' Association reported that its seasonally adjusted Purchase Index decreased 5.0% last week, but generally remains stable for the last couple of months. This series is comparable to year-ago levels excluding those periods when home buyers rushed to beat the expiring $8000 tax credit. Contrarily, the Refinance Index declined for the fifth straight week, by 0.7%. As I said last week, rapidly increasing mortgage interest rates are killing refinancing, and this may have an effect on consumer spending later. The ICSC reported same store sales for the week ending December 11 increased 3.1% YoY, and increased 0.8% week over week. Shoppertrak reported that sales declined -0.4% YoY in the week ending December 11. They anticipate that Holiday sales will increase about 4% YoY when all is said and done. Railfax showed improvement in most measures compared with last year. Additionally, for the first time in a while, shipments of lumber and scrap metal are comfortably above last year's numbers, indicating some improvement in the housing market. The American Staffing Association reversed its Thanksgiving week decline and is back at 101 for the week ending December 4. This index will decline significantly over the next several weeks as it always does, and won't give much reliable information again until January. M1 was down -1.5% for the week, down -.3% vs. last month, and +8% YoY, meaning "real M1" is up 7.0%. M2 held steady for the week, but was up +.15% vs. last month, and 3.0% YoY, meaning "real M2" is up 2.0%. Real M2 has stalled without being able to break out of the "red zone" below +2.5% YoY. Weekly BAA commercial bond rates increased from 5.95% last week to 6.09%. This compares with yields on 10 year bond yields going up .25%. All bonds have come under stress recently, but this suggests investors are "reaching for yield." It's worth noting also that bond yields and stocks continue to move in opposite directions, indicating zero fear of a deflationary pulse. The Daily Treasury Statement showed receipts in the first 11 reporting days of December of $77.8 B vs. $67.0 B a year ago, for a gain of 16%! For the last 20 days, $130.9 B has been received vs. $117.5 B a year ago, another strong gain of 11%. The development of commodity inflation, especially as feeding through into the bond market, will have to be watched. Still, with the exception of housing, the economy seems to be firing on all cylinders. A few pundits have begun to use the surprising phrase that the economic recovery seems to be turning "self-sustaining." I would say they are more likely correct than incorrect, and even though we would like a lot more growth in jobs and income, that has to be very welcome news. Before we turn to our analysis of CRA lending data, we have two important points to note regarding the CRA and its possible connection to the current mortgage crisis. The first point is a matter of timing. The current crisis is rooted in the poor performance of mortgage loans made between 2005 and 2007. If the CRA did indeed spur the recent expansion of the subprime mortgage market and subsequent turmoil, it would be reasonable to assume that some change in the enforcement regime in 2004 or 2005 triggered a relaxation of underwriting standards by CRA-covered lenders for loans originated in the past few years. However, the CRA rules and enforcement process have not changed substantively since 1995.2/ This fact weakens the potential link between the CRA and the current mortgage crisis. Using loan origination data obtained pursuant to the Home Mortgage Disclosure Act (HMDA), we find that in 2005 and 2006, independent nonbank institutions—institutions not covered by the CRA—accounted for about half of all subprime originations. (See Table 1.) Also, about 60 percent of higher-priced loan originations went to middle- or higher-income borrowers or neighborhoods, populations not targeted by the CRA. (See Table 2.) In addition, independent nonbank institutions originated nearly half of the higher-priced loans extended to lower-income borrowers or borrowers in lower-income areas (share derived from Table 2). In total, of all the higher-priced loans, only 6 percent were extended by CRA-regulated lenders (and their affiliates) to either lower-income borrowers or neighborhoods in the lenders' CRA assessment areas, which are the local geographies that are the primary focus for CRA evaluation purposes. The small share of subprime lending in 2005 and 2006 that can be linked to the CRA suggests it is very unlikely the CRA could have played a substantial role in the subprime crisis. It is also possible that the remaining share of higher-priced, lower-income lending may be indirectly attributable to the CRA due to the incentives under the CRA investment test. Specifically, examiners may have given banks "CRA credit" for their purchases of lower-income loans or mortgage-backed securities containing loans to lower-income populations, which could subsequently affect the supply of mortgage credit. Although we lack definitive information on banks' CRA-induced secondary market activity, the HMDA data provide information on the types of institutions to which mortgages are sold. The data suggest that the link between independent mortgage companies and banks through direct secondary market transactions is weak, especially for lower-income loans. (See Table 3.) In 2006, only about 9 percent of independent mortgage company loan sales were to banking institutions. (Figure not shown in table.) And among these transactions, only 15 percent involved higher-priced loans to lower-income borrowers or neighborhoods. In other words, less than 2 percent of the mortgage originations sold by independent mortgage companies in 2006 were higher-priced, CRA-credit-eligible, and purchased by CRA-covered banking institutions. Two basic points emerge from our analysis of the available data. First, only a small portion of subprime mortgage originations is related to the CRA. Second, CRA-related loans appear to perform comparably to other types of subprime loans. Taken together, the available evidence seems to run counter to the contention that the CRA contributed in any substantive way to the current mortgage crisis. So, who are you going to believe. A group of economic wonks who have done a ton of research looking at the data, or a bunch of Congressional/political hacks who have been lobotomized by the Washington political process? While the recent decline in first time unemployment claims is certainly good news, the fact remains that over 400,000 initial jobless claims have been made each and every week for a long time. Since the beginning of August 2008 to be precise. That got me wondering how long initial claims were over 400,000 in the other severe recessions of the 1970s and early 1980s. As it turns out, in the 1973-74 recession, they only exceeded 400,000 for 1 year: November 1974 to November 1975. In the "double dip" 1980 and 1981-82 recessions, however, claims remained elevated over 400,000 for a full 4 years -- November 1979 through November 1983! Comparing that with the time unemployment over 6% gives us the following graph of two periods of "hard times:"
In fact, unemployment stayed over 6% for all but a few months in 1978-79 for a full 17 years, from April 1974 to August 1987. That is certainly a portrait of a very bad decade, that we hopefully are not in the process of repeating. This, second graph is the better one, since we are measuring both first time claims and the unemployment rate as percentages of population. And it paints a more interesting picture. Seen in this light, we have improved to the point where are having fewer layoffs now than we have had in about half of the last 35 years. Notice too that by this measure, the unemployment rate and initial jobless claims track closely, with 2 exceptions. One is during the very brief 1979 recession, where there wasn't time for unemployment to rise very much. The second time is right now. Unemployment remains far more elevated than is suggested by the relative lack of layoffs. In other words, the poor employment situation isn't so much that a large number of people are still being laid off, but rather that hiring for new jobs is close to pathetic. It strikes me that this is of a piece with why we haven't seen new hiring keep up yet with real retail sales (as I described yesterday). I think I can pinpoint why. I'll put up a post on that next week. Manufacturing activity has picked up this month in the Mid-Atlantic region. The Philadelphia Federal Reserve's index rose nearly two points to 24.3 to indicate significant improvement in the sample's subjective assessment of general business conditions. Specific readings on new orders and backlog orders are both picking up steam which is good news for future shipments and employment. Shipments increased though at a slower pace than November's pace. Manufacturers in the sample added to their workforces though, like shipments, at a slower pace than in November. They did however sharply extend the workweek, that is they worked their existing workforce longer. Hopefully employment will begin to pick up in line with orders. 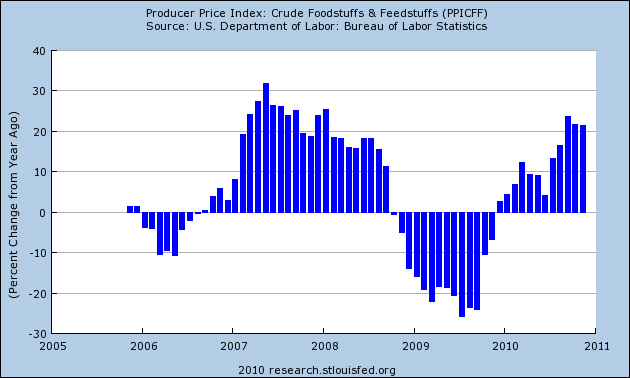 Both input prices and output prices spiked reflecting rising fuel and commodity costs. This could mark the beginning of a trend or could just be a one-time blip. This report, led by new orders, adds to this week's good news on the manufacturing sector. Like the Empire State survey, the Philly Fed number dropped probably as a result of the EU situation. However, it appears the region has bounced back. 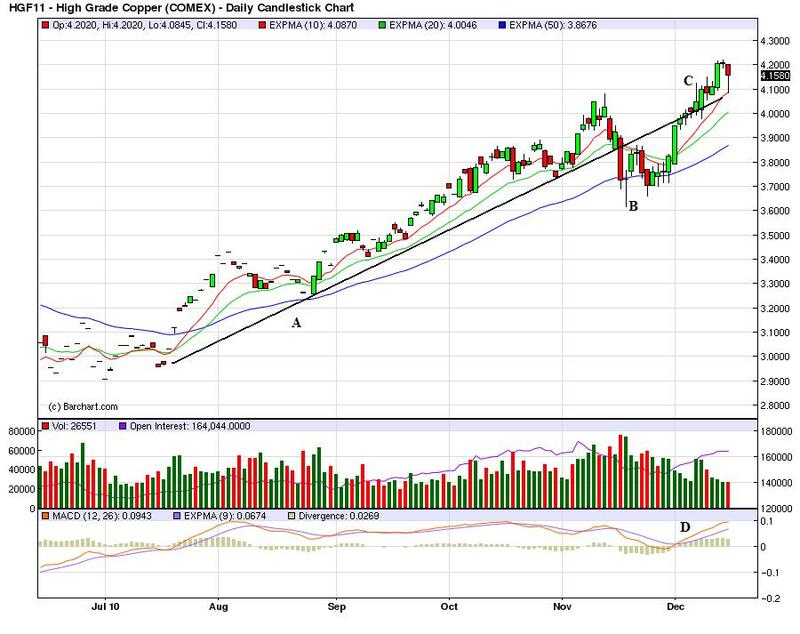 First, note that equity prices broke through a key downward sloping trendline yesterday. Note the sharp, early morning sell-off (a) followed by a strong rally (b). 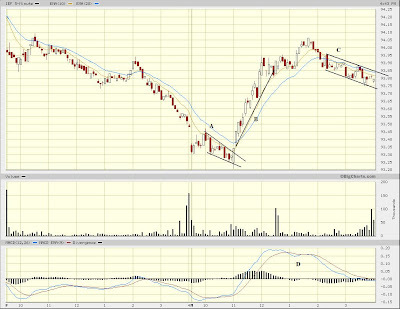 After the MACD (d) printed same height peaks (a bit before (a) on the chart), a reversal was likely. 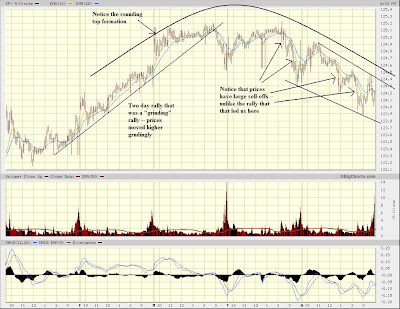 Prices broke the uptrend and then moved sideways for the rest of the day. On the SPYs daily chart, notice that prices are still printing small bars on decreasing volume, indicating the intensity of trade has slowed. This is to be expected considering we're going into the end of the year holidays. Also note the IWMs are rallying, indicating that risk based capital is still moving into the market. Yesterday the Treasury market also revered several days of declines. In the afternoon, notice the three different trend lines whose angle increases. This indicates the momentum behind the rally was gaining steam as the trading day progressed. Fewer workers than forecast filed claims for unemployment benefits last week, pointing to a drop in firings that signals the U.S. job market is improving. Applications for jobless insurance payments fell by 3,000 to 420,000, sending the average over the past four weeks to the lowest level since August 2008, according to data from the Labor Department issued today in Washington. Other reports showed work began on more houses last month and manufacturing picked up in the Federal Reserve Bank of Philadelphia region in December. A decrease in firings would be a harbinger of bigger gains in payrolls that will help bring down the jobless rate, which has been at 9.5 percent or higher for 16 consecutive months, the longest stretch since monthly records began in 1948. Fed policy makers this week said they will continue to buy Treasury securities in a bid to reduce unemployment. The Producer Price Index for Finished Goods rose 0.8 percent in November, seasonally adjusted, the U.S. Bureau of Labor Statistics reported today. This increase followed a 0.4-percent advance in both October and September. At the earlier stages of processing, prices received by manufacturers of intermediate goods climbed 1.1 percent in November, and the crude goods index moved up 0.6 percent. 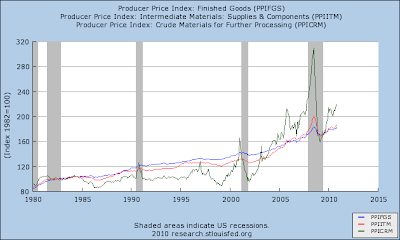 On an unadjusted basis, prices for finished goods rose 3.5 percent for the 12 months ended November 2010, their smallest 12-month increase since a 3.1-percent advance in August. Let's look at the year over year (YOY) percentage change of producer prices at various stages of production. 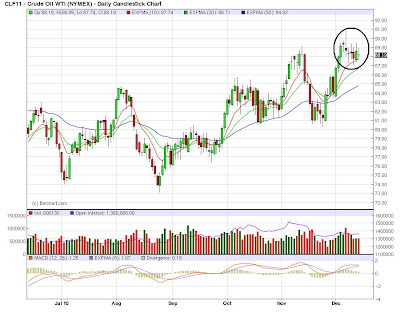 Crude prices are picking up steam, largely as commodity prices increase form the decreasing dollar. 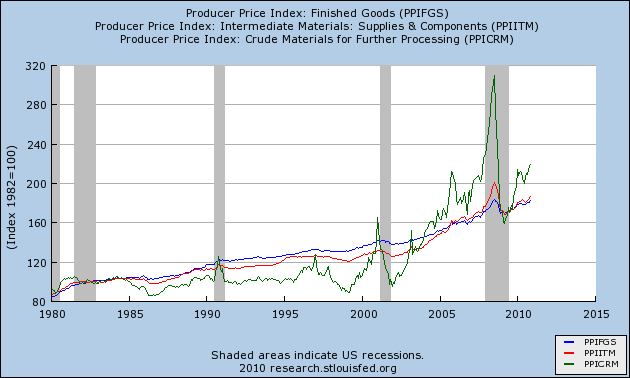 The PPI for Finished goods is also still lower than the last expansion (compare (d) to (a)). Notice the crude goods jump around a lot, whereas the intermediate adn finished goods track each other a lot more closely. Also note that jumps in crude goods move to intermediate and finished goods, but not in as large a way as you might think. 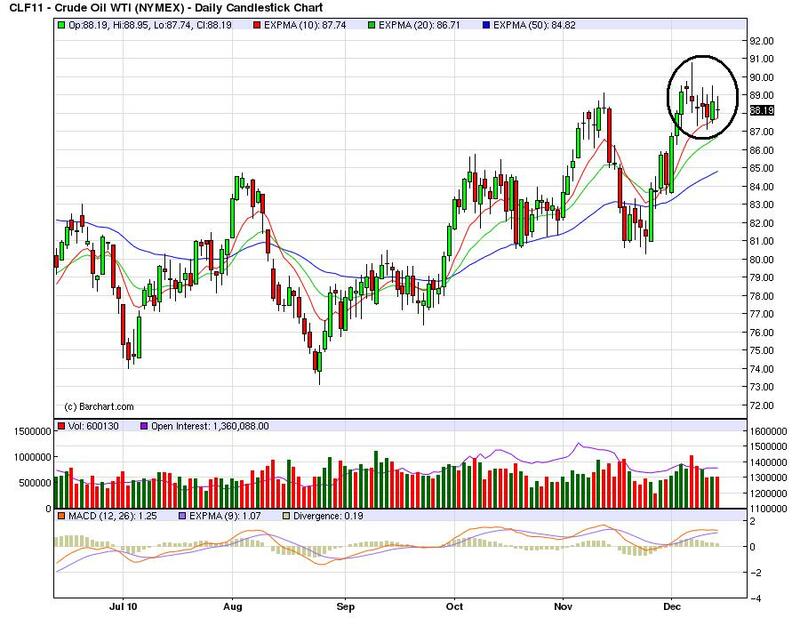 In short, crude prices get absorbed in production. The core figure has been declining on a YOY basis for almost two years, indicating the pace of decline continues and deflation is still an issue. 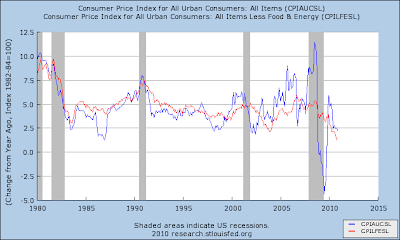 Finally, let's take a look at a chart that compares the YOY change in core and total CPI since 1980. 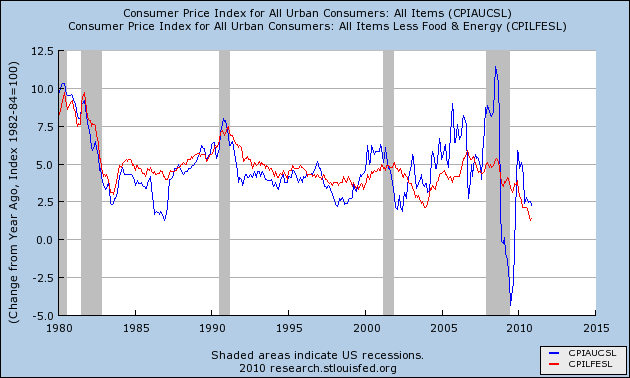 In the above chart, total CPI is the red line, while CPI less food and energy is the blue line. Notice you can divide the chart into basically two areas. The first is before the year 2000 when the core and total CPi tacked each other pretty closely and total CPI was far less volatile. Over the last 10 years, notice the total CPI's YOY percentage change has become extremely volatile, largely as a result of commodity inflation. 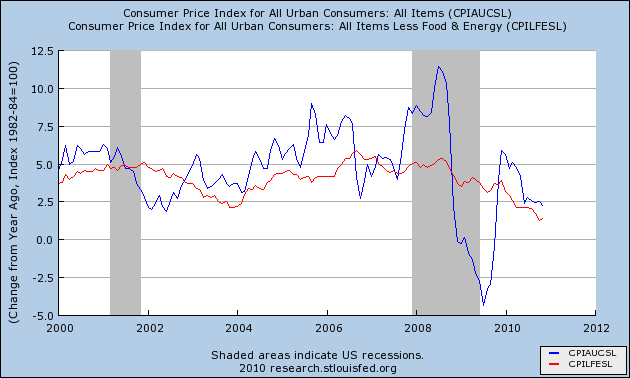 Total CPI has been far more volatile over the last 10 years. The blowout upside report and revisions for retail sales, and the somnolent inflation report, show that real (inflation adjusted) retail sales have grown at a rate of over 6% a year for the last three months. Indeed, real retail sales have exceeded 6% YoY growth for almost half of this year. That bodes very well for employment going forward. Because we have a large number of new readers, courtesy of Citizen K at DK, Jeff Miller at A Dash of Insight, and Seeking Alpha, I am taking this opportunity to explain again why I believe real retail sales are the "holy grail" leading indicator for job growth. The problem is that GDP is only reported quarterly, so by the time you learn the GDP for a quarter (like Q4 2010), you already know what the payroll growth was. At best, YoY GDP when initially reported, can give guidance about payroll growth over the next couple of months. To the contrary, not only do real retail sales correlate closely with payrolls over the long term, but they consistently lead the job market. In fact, real retail sales have consistently turned at both tops and bottoms, an average of 3-5 months before job growth or losses turned with considerable variance (since WW2, the actual lead has been -4, -3, 0, +1, +4, +5, +5, +11, +14, +16, and +17 at tops, and -2, 0, +2, +3, +4, +6, +6, +7, +9, and +23 at troughs). This time real retail sales bottomed in April 2009, 8 months before jobs bottomed, longer than usual but well within its normal range as described above, and not nearly with so much a lag as in the 2002-03 "jobless recovery." as it has just done with regard to the "Great Recession:"
Not only do real retail sales have an excellent track record leading turning points for job growth and contractions, but they also have a very strong relationship to the rate of those jobs added or lost. Thus, the above graph, based on a relationship that goes back over 60 years, strongly suggests that job growth is going to turn stronger, and very soon. To see this, let's examine the year-over-year percentage changes in each. That is what the next series of graphs show. Because real retail sales are historically much more volatile, these graphs take the YoY percentage change in real retail sales and divide by 2 (blue line), which historically yields a very close fit with YoY payroll changes (red line). 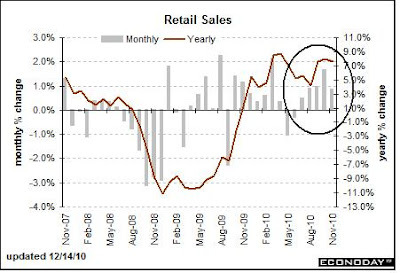 Notice that real retail sales not only lead, but that the amplitude of the changes is usually very similar. In fact, the weakest relationship by far occurred during the lame "Bush expansion." Real retail sales only went up more than 5% YoY (translating to 2.5% on our graph) for 4 months during that entire time: February and March 2004 and June and July 2006. It took 12 months thereafter for YoY job growth to peak at 1.7%. If our recovery were as weak as the Bush expansion, that would still mean 2 million jobs added in a year by spring 2011, or an average of 165,000+ jobs a month. Real retail sales have been up over 6% YoY now for 5 of the last 10 months. We were here once before, in April, before a nearly simultaneous confluence of bad events - the BP oil disaster, the Euro crisis, Oil at $90, and the expiration of the $8000 housing credit - knocked us into the summer slowdown, when both consumers and employers temporarily "froze" as they worried about a repeat of the 2008 financial panic. If we can avoid a similar series of setbacks, I am confident that at some point within the next 12 months, payroll growth is going to approach the growth in real retail sales, just as it has for over 60 years. And that means some pretty strong job growth in the upcoming months. Over the last five days, notice the SPYs are forming a rounding top. In addition, the rally up was grinding -- prices were moving higher, but there were very few strong bars or rallies; instead prices were inching up and then giving back a fair amount of ground. In contrast, the last two days we've seen a sell-off with strong moves lower, printing very strong bars. 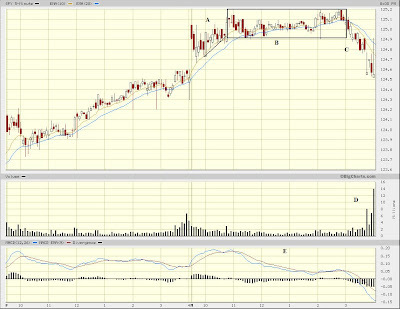 Yesterday, prices rallied to the 68.2% Fibonacci level (a) before selling off to the 38.2% Fib level. Prices then moved sideways and hit the EMAs before moving lower (b). 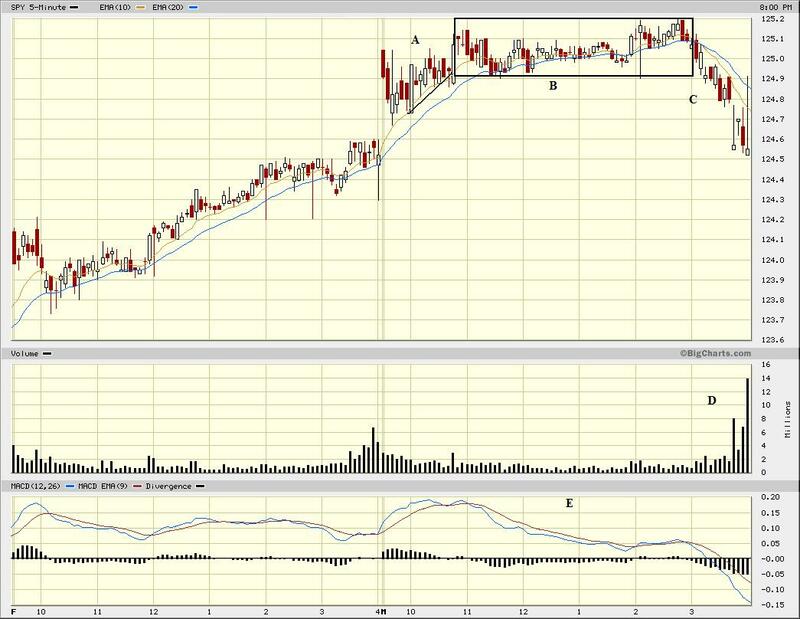 After selling off, prices moved into a grinding rally, but broke the trend and again moved lower (c). Prices then sold-off, rallied to (d) and sold off again. Over the last few weeks, notice that Treasury prices have had several gaps lower (a) and some very strong bars lower (b) as well. This is a strong sell-0ff. A closer look at the dollar shows the price/EMA situation is still mired in indecision. The EMAs are more or less moving sideways with prices trapped there. 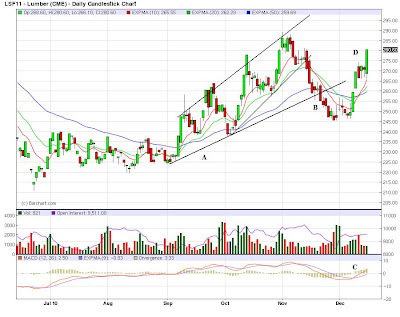 Lumber was in an uptrend (A), which it broke at (B), when prices started to move lower. 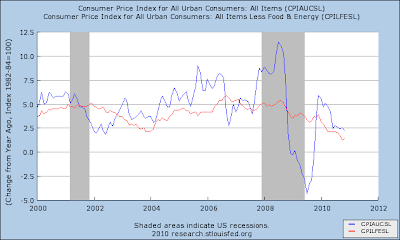 However, prices have started to rebound (D) and momentum is increasing (C). I use lumber as a proxy for the new home market. Copper is still in a strong uptrend (A). 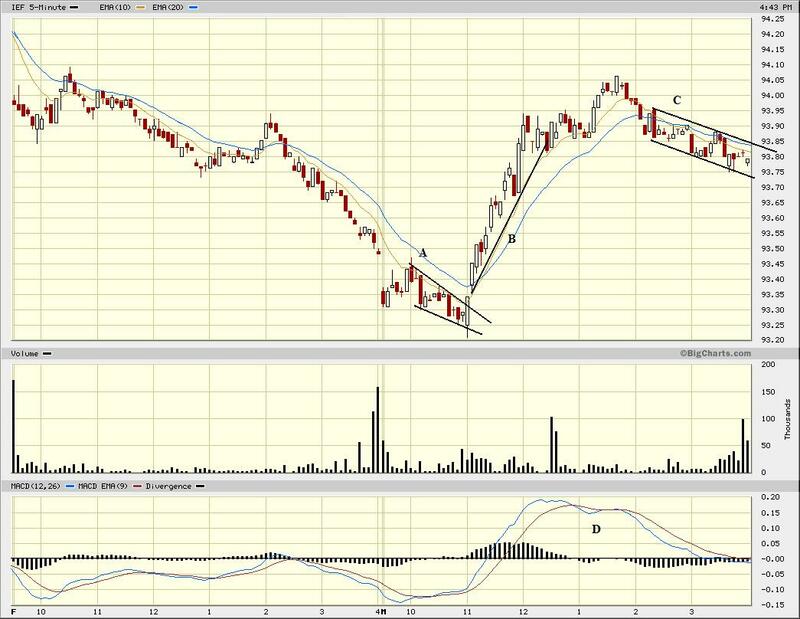 Although prices dipped a few weeks ago (B), they are now back above the trend line (C). Also note the MACD is increasing (D)and the EMAs are in a very bullish orientation. The Empire State Manufacturing Survey indicates that conditions improved in December for New York State manufacturers. After dropping sharply into negative territory in November, the general business conditions index bounced back above zero, climbing 22 points to 10.6. The new orders and shipments indexes also rose above zero, while the unfilled orders index remained negative. The inventories index was negative, indicating that inventory levels were lower over the month. The indexes for both prices paid and prices received were positive and higher than last month, suggesting that prices rose, while employment indexes were negative, indicating that employment declined. Future indexes were generally at high levels—a sign that conditions were expected to improve over the next six months. Significantly, the future prices paid index was positive and rose sharply, indicating that respondents expected input prices to accelerate. Notice the Philly Fed also fell into negative territory a few months ago, but is now also printing a positive number. Manufacturing production increased 0.3 percent in November. The factory operating rate moved up to 72.8 percent, its highest level in more than two years but still well below its long-run (1972 to 2009) average of 79.2 percent. The output of durable goods rose 0.4 percent, and with the exceptions of nonmetallic mineral products and motor vehicles and parts, output advanced in all of the major industries. Gains of 1 percent or more were reported in wood products, primary metals, fabricated metal products, machinery, computer and electronic products, and miscellaneous manufacturing. The production of nondurable goods rose 0.2 percent. Increases of 1 percent or more occurred in paper, printing and support, and plastics and rubber products. The indexes for petroleum and coal products and for chemicals both advanced around 0.5 percent. However, the production of food, beverage, and tobacco products declined and more than retraced the previous month's increase. The output indexes for textile and product mills and for apparel and leather both moved lower. In November, the index for other manufacturing (non-NAICS), which consists of publishing and logging, fell 0.7 percent and was more than 7 percent below its year-earlier level. The output of mines edged down 0.1 percent in November, and the capacity utilization rate for mining moved down to 88.7 percent, a level 1.3 percentage points above its average from 1972 to 2009. The output of utilities rose 1.9 percent, as the output of both electric utilities and natural gas utilities increased. The operating rate for utilities rose, to 78.4 percent, but remained below its readings during the summer. The production of consumer goods fell 0.5 percent in November. The output of consumer durable goods moved down 2.3 percent in large part because of a drop of 6.0 percent in the production of automotive products. Production advanced for all of the other major durable goods categories: home electronics; appliances, furniture, and carpeting; and miscellaneous consumer durables. The output of nondurable consumer goods was unchanged in November following declines in the two previous months. Among non-energy nondurable goods, the indexes for foods and tobacco, for clothing, and for chemical products all posted declines, but the output of paper products moved up 0.3 percent. The production of consumer energy products rose 1.9 percent as a result of both higher sales to residences by utilities and an increase in gasoline refining. The output of business equipment rose 0.9 percent in November and was 12.5 percent above its level a year earlier. The indexes for industrial and other equipment and for information processing equipment both rose about 1-1/4 percent. The production of transit equipment fell 0.6 percent, which more than reversed its October increase. In November, the index for defense and space equipment moved up 1.5 percent--its second consecutive monthly increase. The production indexes for construction supplies and business supplies both rose 0.9 percent in November. Over the 12 months ending in November, the output of construction supplies has moved up 6.0 percent, while the output of business supplies has increased 1.4 percent. The production of materials increased 0.7 percent in November, which more than reversed the October decline. The output of durable materials advanced 0.9 percent, as a decline in the output of consumer parts was more than offset by gains in the production of equipment parts and other durable materials. The output of non-energy nondurable materials also rose 0.9 percent. Within this market group, the indexes for chemicals and paper advanced following declines in the previous month. However, the production of textile materials recorded its fourth consecutive monthly decline. The production of energy materials moved higher with the gains in utilities and in support activities for oil and gas operations more than offsetting a decline in crude oil extraction. 1.) The broad based increases are welcome and indicate the manufacturing sector is still in a strong recovery. It also indicates the moderate slowdown that was caused by the EU situation in the Spring appears to be over. 2.) The increase in business equipment output should be a good harbinger of the business and equipment investment sub-category of the GDP report. This is further bolstered by the increase in communication equipment. 3.) The increase in construction supplies is interesting and is somewhat confirmed by lumber prices, which tried to rally off a bottom, fell back and are currently moving a bit higher. 4.) The broad increase in consumer durables is very encouraging, and indicates that businesses are thinking consumers will increase their purchases of these items. This bodes well, as these are typically more expensive items that usually require some type of financing to purchase. Simply put, this is a very encouraging report. Why Have Bond Yields Increased? Over the past month, interest rates have increase from 2.62% to 3.3%. In Monday's FT, the paper proffers three reasons for the increase: better economic news, indicating a move from safe haven Treasuries to equities is warranted, higher inflation expectations and the Fed will not engage in QE2 because of the political backlash. To this, I will add a fourth, which is concern for the U.S.' fiscal situation. Better economic news: Outside of employment, the news has been positive. Retail sales are strong, household net worth is up, initial unemployment claims appear to be decreasing, manufacturing is still strong and the tax deal went through Congress. In short, it appears that things are looking up after the stall caused by the Spring. Good news means that companies should see an increase in earnings, which raises equity valuations, making bonds less attractive. Higher inflation expectations: These are being stoked by the decreasing dollar and its negative impact on commodity prices (which move inversely to the dollar). More precisely, oil's recent increase to around $90/bbl is adding to inflationary concern. However, the US CPI number is still very low -- especially year over year -- so I really don't see this being a root cause of the Treasury sell-off. The Fed will back off QE2: not according to yesterday's Fed statement. The tax deal will lead to a worsening of the US fiscal situation: the markets have dropped sharply since the deal was passed, indicating the deal is probably leading to concern about future debt issuance from the U.S. The bottom line is the tax deal will lead to lower revenue for the government, meaning the US is not serious about its fiscal health. I think its about 50/50 between the better economic news and the tax deal. There is no way to empirically prove this breakdown; its merely an intuitive guess. Notice that in the last two days, the markets have had a late day sell-off on high volume. This indicates traders are getting nervous about the market, thinking that overnight there will be a news event that will sent the market lower. 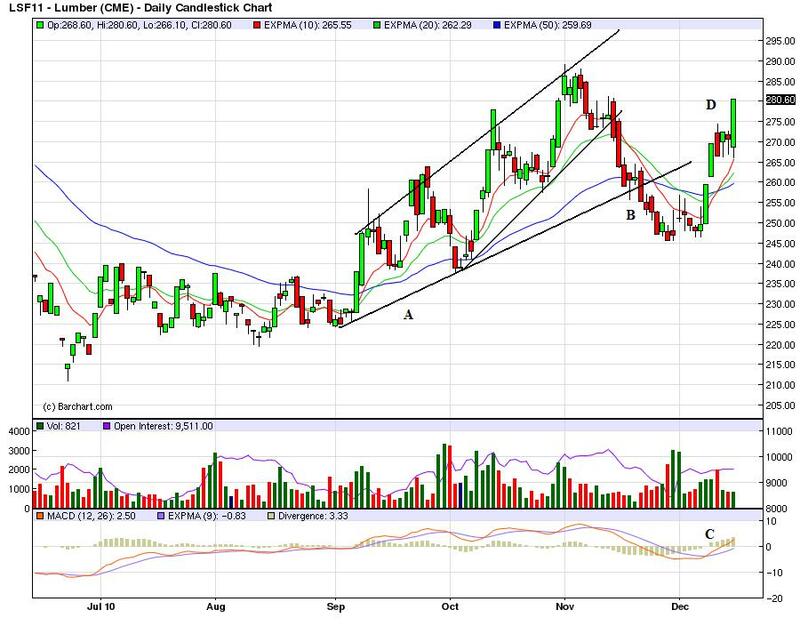 On the daily chart, notice there are two series of bars. The first (a), are a series of very strong, upwardly moving bars. The second (b) are smaller, indicating weakening upward pressure and a slackening of demand. 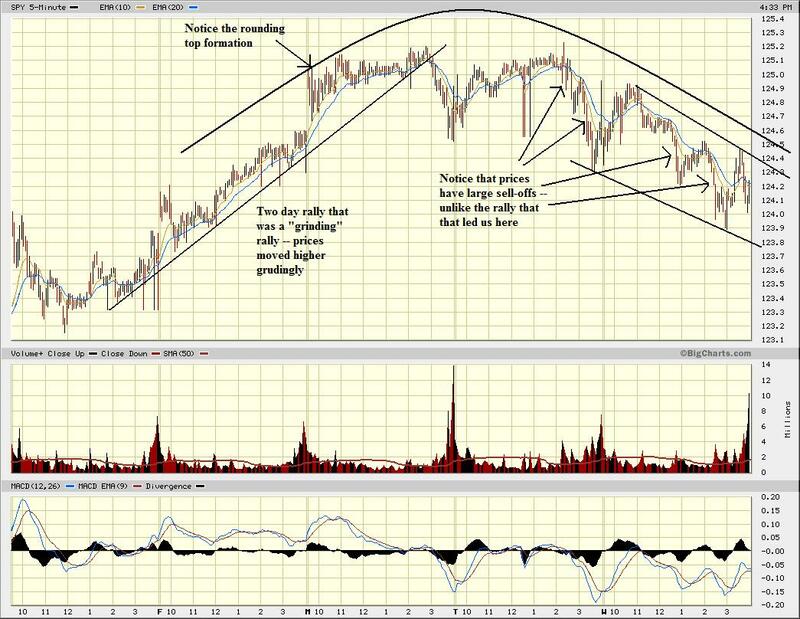 The Treasury market is continuing to sell-off (a) in a big way on high volume (b). The dollar is still mired near the EMAs, which are also in a tight range. Also note that prices are near key Fibonacci levels. So -- stocks are still moving higher, but are printing weaker and weaker bars. Bonds are in the middle of a fire sale and the dollar is looking for a direction. 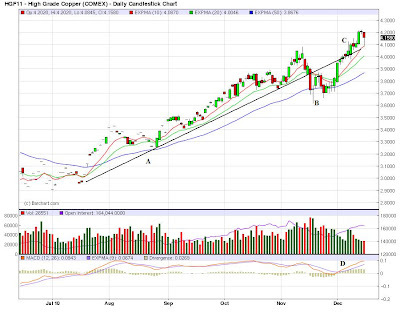 After moving through the key $90/level, prices have retreated to the 10 day EMA. However, notice the very bullish EMA orientation -- all are moving higher, the shorter EMAs are above the longer EMAs and prices are above all the EMAs. However, the MACD is currently moving sideways, indicating momentum is decreasing. Retail sales for November came in much stronger than expected, but a big question is how much of it is due to inflation. Overall retail sales in November posted a healthy 0.8 percent gain, following an upwardly revised 1.7 percent boost in October. The latest number topped the median market forecast for a 0.6 percent increase. Excluding autos, sales were even more robust with a 1.2 percent rise, following a 0.8 percent jump in October and coming in above analysts' forecast for a 0.7 percent increase. Sales excluding autos and gasoline rose 0.8 percent, matching October's advance. For the latest month, overall sales were led by a 4.0 percent spike in gasoline station sales which likely was price related. Also likely suffering upward price pressure was a 0.8 percent rise in food & beverage store sales. Nonetheless, many other components were notably strong, including sporting goods & hobby, up 2.3 percent; clothing, up 2.7 percent; and general merchandise, up 1.3 percent. A standout weakness was in electronics & appliance stores, down 0.6 percent, and likely weak from discounting. Overall retail sales on a year-ago basis in October slipped to 7.7 percent from 8.0 percent the prior month before. Excluding motor vehicles, sales came in at up 6.7 percent, improved from 6.6 percent in September. Retail sales have printed very strong numbers for the last four months -- they are more or less on fire. Regarding the inflation points made in the article: food service sales comprise 13.21% of the total number, while gas sales comprise 9.53%. So, assuming the worst -- that the gains we are seeing are inflation and not real sales gains -- only about 25% of the sales total are severely impacted by the inflation numbers. Over the last 12 months, the index for all items less food and energy has risen 0.6 percent, the smallest 12-month increase in the history of the index, which dates to 1957. The energy index has risen 5.9 percent over that span with the gasoline index up 9.5 percent. The food index has risen 1.4 percent, with both the food at home index and food away from home index rising the same 1.4 percent. While a case can be made for gasoline inflation being an issue, the food index does not appear to be running at very high levels over the last 12 months. Moody's warned on Monday that it could move a step closer to cutting the U.S. Aaa rating if President Barack Obama's tax and unemployment benefit package becomes law. The plan agreed to by President Barack Obama and Republican leaders last week could push up debt levels, increasing the likelihood of a negative outlook on the United States rating in the coming two years, the ratings agency said. For the United States, a loss of the top Aaa rating, reduce the appeal of U.S. Treasuries, which currently rank as among the world's safest investments. Confidence among U.S. small businesses rose in November to the highest level since the recession began three years ago as more companies projected the economy and sales will improve, a private survey found. The National Federation of Independent Business’s optimism index increased to 93.2, the highest since December 2007, from an October reading of 91.7. Seven of the index’s 10 components rose and three declined. The measure averaged 100.7 during the previous expansion. A brighter outlook for the world’s largest economy means small-business owners may pick up the pace of hiring after the jobless rate reached a seven-month high. With more businesses expecting higher sales, the survey also signals an increase in consumer spending, which accounts for 70 percent of the economy. 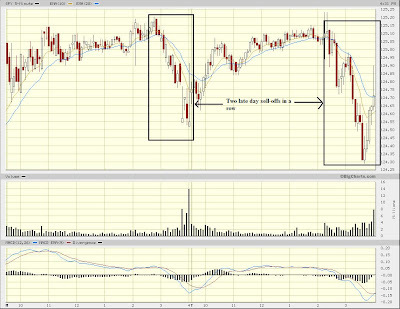 The market opened a bit higher yesterday (A), but then spent most of the day in a sideways pattern (B). 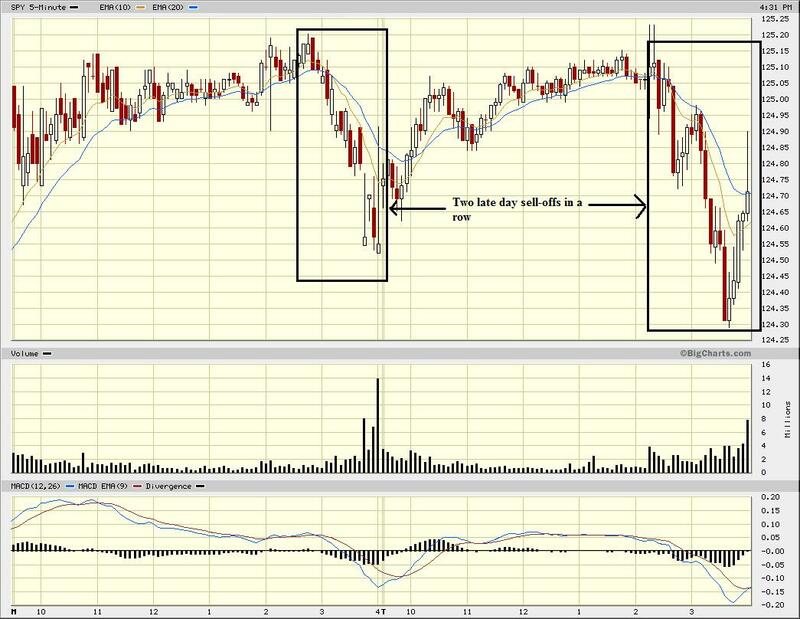 The real story was the end of the day sell off (C) on high volume (D). Also note that momentum was dropping for most of the day (E). The Treasury market opened lower in a slight, downward sloping pennant pattern (A), but then rose sharply (C), followed by a consolidation of gains (C). Again, note that momentum peaked about halfway through the session and then moved lower (D). There is a diary that shot high up on the recommended list there, featuring a David Stockman interview on CNBC. The post purports to show how the "job market is worse than you think" by quoting Stockman to the effect that the only jobs created in the last year have been temporary jobs, and no jobs have been created in the "core economy." Of course, it was breathlessly embraced as proving Doom. Apparently nobody (besides me) bothered to watch the actual video. Let me say at the outset that I do suspect that the jobs added in the last year probably on average pay less than the 8 million plus jobs lost in the Great Recession, and that offshoring manufacturing jobs in particular is a tremendous headwind to the economy, not to say a great tragedy for all working Americans. But, there are two problems with Stockman's approach. The first is that he nowhere justifies his opinion that the sectors of the job market that he claims aren't growing in fact pay higher wages than the part he claims is growing. In fact he takes entire swathes of the BLS jobs breakdown- including the entire retail sector - and labels them "part time" jobs without any support whatsoever. As to whether they are lower paying than the other sectors he claims in the "core" economy. like construction or insurance, tain't necessarily so. The answer is probably buried in government statistics somewhere, but the BLS certainly doesn't so categorize it's reports. The second problem goes right to the heart of his claim. Here's how he comes to his "zero net job creation" metric. He divides the million jobs added this year into 3 or 4 subcategories. He then sets aside state and local government job losses of 250,000+ in a separate category. He then "nets out" one of the growth subcategories (in his case, basically manufacturing + construction, which we already knew weren't growting???) by grouping it with state and local govenment losses and - surprise, surprise - a slice of job growth + 250,000 government job losses ~= 0. Additionally, part of his claim that the loss of "core government" jobs (by which he means, excluding eduction) is so bad, is a claim, at the 7:20 mark, that the average government job pays $15,000 a month! It would have been equally valid, using his own metric, to opine, "The entire job stagnation this year is coming from low paying retail and part time jobs and from state and local jobs. All of the net job creation is coming from the higher paying sector of what I call the 'core economy' of manufacturing, construction, FIRE, media and information - and that is a great positive." In short, any of the slices of job creation + state and local job losses approximately equals zero. The slice you choose to group with those losses, and the slice you choose to highlight as where growth is coming from is a completely editorial position, based on the story you want to sell. In other words, spin. Of course, since Doom is what the commenters wanted to hear, Doom is what sold. Nobody bothered to check the actual information. Here is a link to Stockman's video on CNBC: Between 3:90 and 4:20 in he describes the middle class jobs description: construction, manufacturing, finance, information tech etc.. In other words, he classifies goods producing and professional/business jobs as middle class. According to the NBER, the recession ended in June 2009, when -- according to the BLS -- there were 16,453,000 professional jobs. In the latest BLS report, there were 16,861,000 jobs, or an increase of 408,000. Construction and manufacturing jobs have been essentially flat. Also note that Stockman does not include health care and education jobs in his tally. Had he included this in his calculations, another 554,000 would have been added since the end of the recession (total jobs increased from 19,165,000 to 19,719,000). In addition, pay is down now because of the large amount of slack in the employment environment: wages simply are not going to increase when unemployment is over 9%. Stockman's point is valid: job growth is too slow right now and needs to accelerate. In addition, he highlights the fact that what were once solid, middle class jobs (construction, manufacturing) are now areas of overall attrition. I highlighted this in a series about six months ago (see here and here). But this is a long-term trend -- as in 30 years; this recovery's data is simply a continuation of the trend. But getting back to this recovery's data, his interpretation is flat out wrong. The 55 respondents, not all of whom answer every question, raised their growth projections for gross domestic product for nearly every period, including the current quarter. On average, the economists now predict GDP will grow 2.6% in the current quarter at a seasonally adjusted annual rate, up from the 2.4% growth they projected in last month's survey. The economy grew 2.5% in the third quarter. 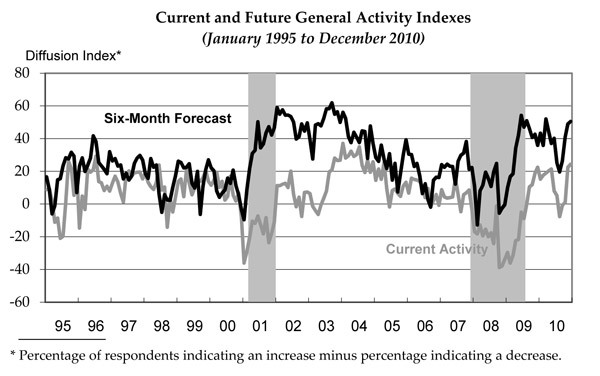 The economists now see stronger expansion in the first half of 2011, with growth picking up speed as the year progresses. For the year, they expect GDP will rise 3%. Meanwhile, they have reduced the odds of a double-dip recession to 15%, the lowest average forecast of the year, from 22% in September survey. The majority of the respondents also say that there is a better chance the economy in 2011 will outperform their forecasts than that it will underperform. Thirty-five economists said the risks to their forecasts are more to the upside; 14 said the risk was to the downside. The world's leading economies should continue to grow, but at a more stable pace with signs that growth across all of the major economies is steadying, according to a survey of leading indicators released by the Organization for Economic Cooperation and Development Monday. The figures point to "expansion" for developed economies as a whole, but the range of movement is limited with the majority of countries surveyed reporting a rise or fall of around 0.1 points, the survey shows. The Composite Leading Indicator for the OECD's 30 members rose in October to reach 102.6 from 102.5 in September. "OECD composite leading indicators, designed to anticipate turning points in economic activity, suggest a stabilization in the pace of expansion across the OECD," the organization said. 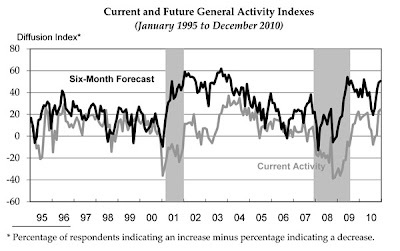 A level above 100 suggests expansion while a figure below suggests contraction, although when the index is below 100 but is rising, the index shows the economy in question is recovering. These two stories are consistent with my own observations. The slowdown caused by the EU situation last spring appears to be abating. Most indicators are still showing an expansion. 8 months after GDP bottomed out, there is such a stark bifurcation between the American industrial and consumer economies that you may as well be looking at statistics from two separate countries. The financial (Wall Street) and industrial recovery is V-shaped and stronger than any recovery since 1983. The economy of wages and employment, and of houses, autos, and general retail - in short, the consumer economy of average Americans - is little better than L-shaped and in some cases isn't happening at all. We really do have two separate economies. We are now 8 months more past that declaration, and yet it is still true. 2010 was the year of the Bifurcated, V and L shaped recoveries. Large corporations, manufacturing and industry, exporters, and transportation sectors are doing well. Jobs and income are improving off the bottom, but at a lackluster pace so far. Construction and state and local government are still mired at the bottom of the recession. 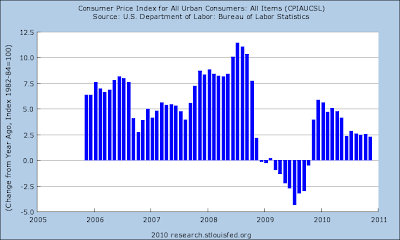 The economy as a whole declined about 4% in real terms in 6 quarters from its peak in the 4th quarter of 2007. There is a substantial chance that when this quarter's GDP it reported, 6 quarters later, the entirety of that decline will have been made up. That, boys and girls, is a V-shaped recovery. Nondurable goods manufacturing declined about 6% from its pre-recession peak (right scale) and has made 2/3 of that up. Employment in that area is still in decline. This is still not as strong a rebound as in the rest of the industrial economy. Although I can't show you a graph, I can tell you that air cargo revenue ton-miles show a smaller rebound as well, having fallen about 40% from 1.262 Billion in December 2006 to 0.764 Billion in February 2009, and as of September 2010 had increased to 0.949 Billion (note: like rail traffic, undoubtedly some of this is seasonal variation, but the YoY increase from September 2009 - 2010 was +3%). III. If industry and associated economic metrics show a strong V-shaped recovery, the best since 1983, the opposite is the case with ground zero for the credit bubble - housing - and also state and local governments. (note: I am addressing volume of new homes built, not prices of either new or existing houses, in this discussion. Foreclosures are likely to continue at high levels for several years yet, and prices, having resume their decline to the long term mean, will likewise continue to do so). Residential spending improved, but relapsed again due to the expiration of the $8000 housing credit. Commercial construction is still declining, but the rate of decline has decreased considerably. Since as CR notes, historically commercial spending has usually bottomed about 16 months after residential spending, because of the delay imposed by the expiration of the tax credit, this time both commercial and residential spending may begin to increase at about the same time. they are still far below where they were two years ago before the recession intensified. Worse, since Congress refused to renew meaningful fiscal assistance to the states, waiting next summer is a $60 Billion shortfall that many states - most expecially California - are completely unequipped to handle. IV. Finally, let's look at jobs and wages. Over two million jobs were lost in construction since its late 2005 peak (note: there is no data breaking this down between residential vs. commercial construction jobs). As you can see, wages are still under intense downward pressure since the onset of the recession, and as a prelude to this past summer's slowdown both were negative, although wages have since recovered vs. inflation. Quite simply, downward wage pressures remain problematic. 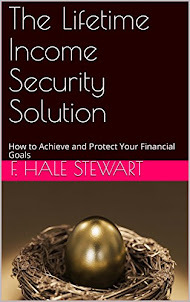 - employment, which is growing slowly; and wages and income, which are barely growing at all. The story of 2010 was indeed that of the bifurcated recovery.